Check out the fabulous, over the top "Queen of Hearts" jewelry from the new Tim Burton "Alice in Wonderland" movie. Candy Heart overload! Size 8/0 Delicas. 60 new colours!!!!! I had planned todays post to be another bronze experiment - however, my week got away from me and I haven't had a chance to fire my bronze. Hopefully, I'll be able to give you an update next week. I do have a pretty beady weekend planned for myself. I've been meaning to get a bunch of new stuff posted on etsy, and I've got a bunch of half finished projects that need some attention. I don't know about you, but February is always hard for me to get anything done. It's cold, dull and grey. I always have great, and fabulous plans - but the couch, with a warm blanket (and Gerard Butler on the telly) usually wins out. So what have you been making? We'd love to see pics. Send em to us - info@beadfx.com, and I'll post them on the blog! Finally! So sorry for the delay! For Muskoka Sunset we had 5 entries, and the winner is Sue L. - Sue, we'll be contacting you tomorrow regarding your prize. And for Fashionista, we had one entry - so that one was easy. Congratulations Francesca! We still have the end of year voting coming up - stay tuned! Stay tuned for a post later this evening. I'm waiting to identify one last kit - then I'll do the draw for the December winner. Our end of year vote will happen sometime within the next couple of weeks. We haven't forgotten - just some technical difficulties! 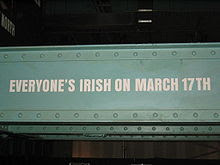 Lá Fhéile Pádraig, St. Patricks Day - or just St. Paddy's day - whichever you prefer to call it, it's coming up on March 17th. Which means you have a wee bit of time to make up something green to wear. Go ahead and get yer green on. I went on a little green hunt this morning for you to give you a bit of inspiration. A Sneak Peek at What's Coming up in March! Before we get to March let's just recap what is left for the month of February. Tonight we have Dwyn's fourth technique night Off Mandrel Implosion Pendants. There are still a couple of spots in this class if any last minute students are interested. This class runs from 7 to 9:30pm. Thursday February 25th is Cindy Vroom's Spiral Rope Lariat from 6 to 9pm. This is a beginner class. February 26th to the 28th Heather Bell-Denison is offering the Art Clay Level One Certification Course. This is a specialized course for people interested in learning and demonstrating proficiency in the use of Art Clay Silver. Upon successful completion of the certification students will be entitled to a 35% discount on Art Clay Silver. February 27th and 28th Lezlie Winemaker is here for her last of two Lampworking Weekends. This class runs from 10 to 6pm each day. Course is open to all levels. Tuesday March 2nd is Charmed I'm Sure with Heather Bell-Denison from 10:30 to 5:30pm. Thursday March 4th and 11th Metal Clay Rings with Heather Bell-Denison. This class runs on two Thursday evenings from 6 to 9pm each night. It is an intermediate level class; students should have metal clay experience-introduction course recommended. Lampworking 101-Part 1 with Dwyn Tomlinson begins on Tuesday March 9th. This class runs for 4 weeks from 7 to 9:30pm each night. This is a beginner level class. 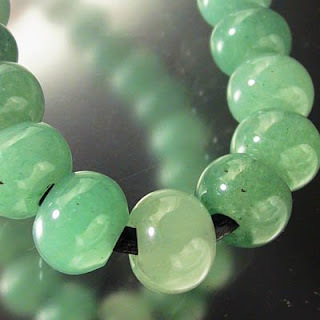 Saturday March 13th is a new class with Nadine Foskin, Double Strand Dangle Bracelet. This class will focus on wrapped loops and working with chain, it is ideal for beginners or anyone wanting to work on their wrapped loops. Sunday March 14th we have Robert Burton's Silver Beaded Wire Wrapped Bracelet and Earrings class from 1 to 4pm. This is an intermediate level class, Beginner Class or previous wire work experience required. 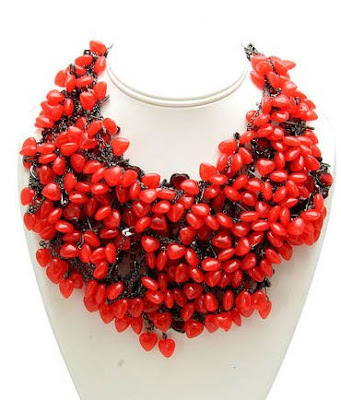 Saturday March 20th is Wire Bead Crochet Basics with Stephanie Dixon from 10 to 1pm. 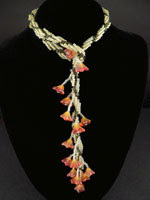 Robert Burton's Wire Working and Wrapping 101 3 week course begins on Monday March 22nd from 6 to 9pm. This is a beginner level course and fills quickly, early registration is recommended. Wednesday March 24th Suzanne Crudden's Metal Working for Beaders: Creating Your Own Production Line begins. This is an intermediate level course; students must have previous metal work experience. Metalworking for Beaders or the Metal Smithing 101 required. This course will run for 8 weeks from 6 to 9pm each week. Cindy Vroom's Oh! Ogalala Bracelet is on Thursday March 25th from 6 to 9pm. 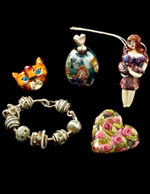 March 27th and 28th we have a Learn to Make Glass Beads Weekend with Amy Waldman-Smith. This is an introductory level course. 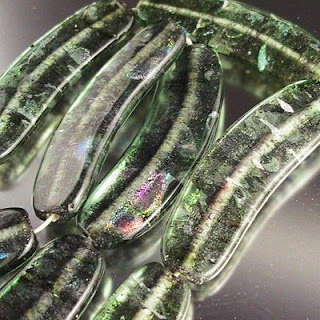 Jennifer Tough is here on March 27th from 1:30 to 5:30pm with an Introduction of Fusing. Don't forget that we have Happy Hour Torching this Thursday from 5 to 9pm. Please call and reserve your torch in advance. OK, so let's run over those turquoise pics again, this time with some identifiers. This is from Nacosarri, Mexico, and this is Natural. This is an area of Mexico due south from Arizona. This is also from the Nacosarri area in Mexico - this one is stabilized. This is stabilized - from the Royston mine, in the south west corner of Nevada - where the highest concentration of turquoise mines appears to be. And this is it stabilized brother, also from Sonora, Mexico. Interestingly - these were the same price per pound. And this is natural turquoise from the Sleeping Beauty mine in Arizona. Arguably, the most beautiful of the turquoise, IHMO. It is a rich colour that typifies turquoise and has an interesting matrix that enhances the stone, without overwhelming it. Hey - another site to waste time on - This is Friends of Irony. Bringing you the very best in photos of things that are - well - ironic. Stone of the Month - Artistic Jasper. Coming at ya a week early - for scheduling reasons. 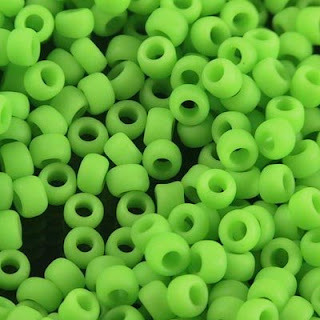 Also our new line of Long Magatamas - smallish Japanese beads shaped like - well - top-drilled sliced carrots. Magatama is a better name, I'm thinking. A linky love Friday for you. Some of my favorite flameworkers today for you. This is only a few links - I have hundreds of favourites of course. Any lampworkers reading today - please feel free to post your link in the comments. I know I'm leaving out a ton of really talented Canadian Beadmakers - so post away! Got a 30 minute ring you'd like to share with the world? Are you a skilled and imaginative jewelry designer who is up for a challenge? Great! Your mission is to design a ring that can be made…start to finish…in 30 minutes flat. Sound fun? We think so. 30-Minute Rings will showcase more than 50 incredibly stylish step-by-step projects that can be created without investing too much of a valuable commodity—time! The selected ring designs will be modern and sophisticated and encompass many different styles and techniques. The common denominator will be fast projects that look terrific! PS: In 30-Minute Rings, we won’t be teaching fundamental jewelry making techniques. Designers can assume that their readers are already proficient (and quick!) at skills such as sawing, soldering, and finishing. The UPS guy moaned and groaned, but we all helped heave 13 big cartons of stuff that I shipped from Tucson. They're all sitting there on the classroom table waiting for me to open them up. It's gonna be like Christmas here tonight! Boxes of freshwater pearls, semi-precious stone, Czech glass, vintage Swarovski, cloisonne, and too many other goodies to mention. And that's not all. While I was there, I ordered other goodies from several manufacturers. These will take a month or two before they arrive. Stay tuned! There'll be lots of new stuff on our website in the coming months. Better clean out your van before you get here tomorrow, Dwyn. I know that most of the country is in full blown Olympic mode but thanks to the invention of time shifting and cable boxes that record for you, you won't have to miss the games to come and take classes! This weekend we have a rare 5 Hour Introduction to Lampworking class with Amy Waldman-Smith on Saturday February 20th from 11 to 4pm. Stephanie Dixon is here with her Wire Crochet Earrings for Beginners from 11 to 1pm. 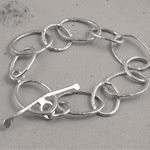 Sunday February 21st is Robert Burton's Silver Braided Bracelet class from 1 to 4pm. Students should have taken a beginner class or have some previous wire working experience. Tuesday February 23rd is a Metal Clay Play Day from 11 to 6pm. Please call and register in advance. Tuesday February 23rd is also the last Technique Night in Dwyn's 4 week series--Off Mandrel Implosion Pendants from 7 to 9:30pm. Thursday February 25th is Cindy Vroom's Spiral Rope Lariat from 6 to 9pm. Friday February 26th to Sunday February 28th is the Art Clay Level One Certification Course with Heather Bell-Denison. The Certification course is an advanced class. The Art Clay Silver introduction course and many completed projects are required prior to taking this class. This is a specialized course for people interested in learning and demonstrating proficiency in the use of Art Clay Silver. Upon successful completion of the certification students will be entitled to a 35% discount on Art Clay Silver. Lezlie Winemaker's last Lampworking Weekend is on February 27th and 28th from 10 to 6pm each day. This course is open to all levels. Don't forget about Happy Hour torching on Thursday from 5 to 9pm, buy one hour get one free! Please be sure to call and book your torch in advance. 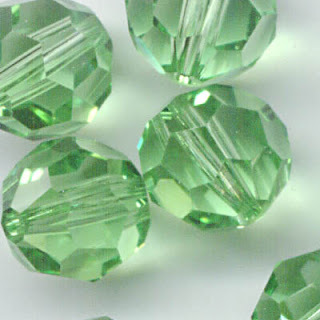 It's not particularly uncommon for a stone or gem to be specific to one area on the globe, or even to one tiny little plot of land, like a single mine. 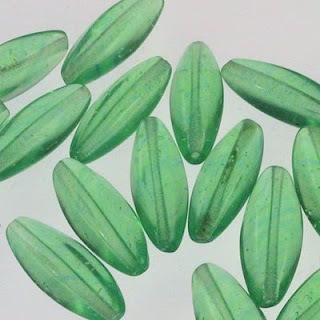 When gems and stone deposits form, they form from the heat and pressure deep underground of a particular chemical soup that has come together, right there, and right then. Anyone who has ever made a particularly good chili, and then spent the rest of their life trying to duplicate it, can appreciate the subtlety of the chemistry involved. A pinch of magnesium, a dollop of zinc - can be all it takes to push the colour off in some other direction entirely. This map shown is a photograph of a postcard showing the various locations, and stones that are typical to that particular mine. So, if you were to hear someone talk about "Sleeping Beauty" turquoise - you can see that it comes from a specific mine in the northwest corner of Arizona. Or that the bulk of the mines are actually clustered in Nevada. Next week - which of those sample I showed you are natural, and which are stabilized? Happy Valentines Day! & Gong Xi Fa Cai! And for Valentine's Day - I got you ... heart medicine. I'm betting you remember Calvin and Hobbes - the comic strip about the boy and his stuffed tiger. If not - hie thee-self to a bookstore and buy one of the compilations of strips - they are still in print - and they are well worth it. 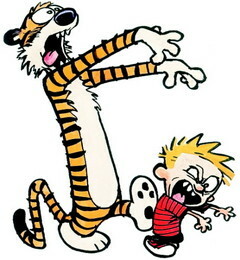 Bill Watterson - the creator and artist - decided to quit while he was ahead. It's been 15 years since he folded the strip. He was fiercely loyal to his vision and staunchly resisted commercialization. Bill Watterson is still alive and well - and here's a recent interview with him. And, if you hadn't noticed - he was a d4mn fine artist. As such - he has inspired a new generation of artists - and here is some tribute art - Calvin and Hobbes re-imagined. Or perhaps you can relate more to cookies that reproduce Calvin's demented snowmen? "Tis better to have loved, and lost - than never to have loved at all." What is especially appropriate about talking about Calvin and Hobbes today is that today is also the start of the Year of the Tiger! Folks born in the year of the tiger (1914, '26, '38, '50, '62, '74, '86, '98) are especially wonderful - no end of truly delightful things are written about Tiger people. Tiger people are difficult to resist, for they are magnetic characters and their natural air of authority confers a certain prestige on them. They are tempestuous yet calm, warm-hearted yet fearsome, courageous in the face of danger yet yielding and soft in mysterious, unexpected places. They enjoy life full of challenges and unexpected events, like visiting unusual places and meet interesting outstanding people. Tiger person finds a pleasure in unpredictable, not afraid to explore new and unusual. Usually open and frank, these people are likely to withdraw and you can be aggressive when trapped. As soon as the tiger person has regained his/her sense of security his/her confidence also returns, enabling him/her to set out once more. These people usually tend to trust their instincts, though there is another side of their personality, which assesses situations thoughtfully before launch any actions. Unpredictable, rebellious, colorful, powerful, passionate, daring, impulsive, vigorous, stimulating, sincere, affectionate, humanitarian, generous. Can be cold, restless, reckless, impatient, quick-tempered, obstinate, ruthless, selfish, aggressive, unpredictable, moody. Or, as my mother used to say, "If the meek shall inherit the earth - what'll happen to us tigers?" This week's focus will be on brass and gold tone findings and beads. Or pendants. Or whatever you want to call that really fabulous leaf! I swear, everytime I try to get something done, something else goes wrong. I had some computer trouble last night. I hope to get the remaining creativefx kits posted today. As soon as I can get them up, I'll post! So, we've had all sorts of little technical glitches. I have only three entries left to post, which Ill get up at some point today. Once I've got those posted, we'll FINALLY do the draw from December. Stay tuned later tonight for the winner to be announced, and we should have the new creatiefx kits posted by next week. The end of year draw is coming soon as well - stay tuned for more details! Bronze Clay - part (who knows)! Over the past few weeks, I've had more firing frustrations with the bronze clay. What I'm finding the most frustrating is that when using a firing method that has worked flawlessly, all of a sudden does not work. My last couple batches of bronze clay have not sintered properly. I first thought that it may be time for a carbon change (your carbon needs to be replaced every 12 or so firings). I changed the carbon, prefired it, and the second batch also did not sinter. hmmmm.... So batch 3, thinking it would also not sinter - of course, this batch fired just fine. While this is all interesting to experiment with, it does create problems for those of us who want to do some production work. Over the next few weeks, I'm going to try to run regular blog posts about my metal clay experiments. Detailing as much as I can about the whole process. Hopefully, this will help those of you struggling with firing problems, and will also serve as a reference for myself. What was done exactly to potentially cause a success (we hope!) or failures. If you are interested in learning to work with metal clays-- this is the month to do it! We have a number of introductory courses as well as an advanced course, making it the perfect time to do it. Friday February 12th is Charmed I'm Sure with Heather Bell-Denison from 10:30-5:30pm. This is an introductory Art Clay Silver class. Saturday February 13th, from 10 to 5pm, is An Introduction to Art Clay Copper. This class is very different from the Art Clay Silver class and it is recommended that if you are interested in working with Art Clay Silver and Art Clay Copper you should take both of these introductory courses. The clays work in different ways and there are tricks to working with each. If you are looking for a more advanced metal clay class Heather is also offering the Art Clay Level One Certification Course on February 26th to 28th. This is a specialized course for people interested in learning and demonstrating proficiency in the use of Art Clay Silver. Students should have taken an Introductory course, as well as, having lots of practise using Art Clay Silver before taking this class. Metal Clay not your thing yet? Don't despair we have more! By more of course, I mean other classes! Lezlie Winemaker is here on February 13th and 14th for a Lampworking weekend. This class is open to all levels and will run from 10 to 6pm each day. Tuesday February 16th Dwyn Tomlinson is running a 4-hour Introduction to Lampworking class. This class runs from 4 to 8pm and is a great way to try out lampworking to see what you think. Saturday February 20th Stephanie Dixon is here with her Wire Crochet Earrings from 11 to 1pm. This is a beginner level class. Amy Waldman-Smith is running a 5 hour Learn to Make Glass Beads session from 11 to 4pm. Amy rarely offers these one day courses, don't miss your opportunity if you were looking to take a class with her but cannot make it out for the entire weekend. Robert Burton's Silver Braided Bracelet is on Sunday February 21st from 1 to 4pm. Students should have previous wire working experience. February 23rd is a Metal Clay Play Day from 11 to 6pm. Dwyn Tomlinson is also here with the last technique night in this series--Off Mandrel Implosion Pendants, from 7 to 9:30pm. Dwyn will be starting a 4 week beginner lampworking course in March, check the site for details. Cindy Vroom is back this winter with her Spiral Rope Lariat on Thursday February 25th from 6 to 9pm. Happy Hour Torching is on Thursday from 5 to 9pm, buy one hour get one free! Don't forget that we are closed on Monday February 15th for Family Day! Calling All Canadians in Tucson! Party Time!! Tucson - If its Tuesday, it must be ??? Let's Play: Spot the Turquoise!